Protecting critical information assets is far more complex than merely backing up “data” to tape. IT managers today are faced with exponential data growth, data management complexity, and high storage management costs. StoneFly Snapshot is designed for IT professionals who want an efficient and easy-to-use method of recovering critical data quickly and is ideal for meeting recovery point objectives (RPO). Snapshots are virtual, temporary, and perishable point-in-time images of an active live volume. Snapshot volumes appear to the host as if they were regular volumes and can even be written to while preserving the original. Snapshots can be created nearly instantaneously requiring less time to quiesce applications and far less server overhead for backups. A Snapshot contains an intelligent replica of the volume at the exact point in time that the Snapshot was taken yet requires significantly less disk space than a full copy. 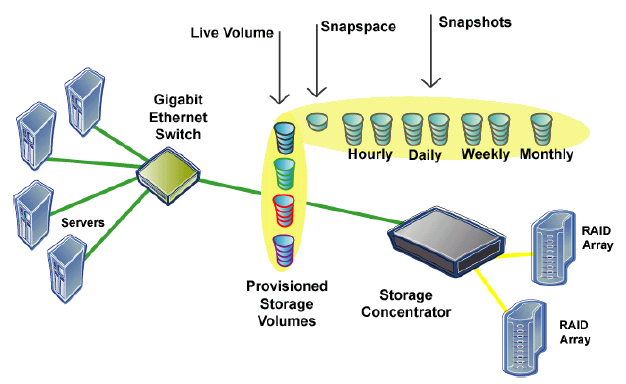 The primary benefits of Snapshots are their smaller storage requirements and their low system overhead. Snapshots persist across reboots and can be mounted and accessed just like any other volume. The Storage Concentrator can automatically take Snapshots at predetermined intervals using the Snapshot scheduler. Administrators can configure the system to automatically take Snapshots hourly, daily, weekly and monthly. Snapshots are used for a variety of applications, including backup/restore, data migration, and disaster recovery. Backup/Restore: Snapshots are copied on a periodic basis and can be restored quickly in case of data loss. A Snapshot can be mounted as a separate volume, leaving the original undisturbed. Once the Snapshot is backed up, it can be deleted as required. Automated Zero Window Backup: Used to automatically create a Snapshot of a Live Volume for backup, virtually eliminating the backup window and removing the production server from the backup process. Disaster Recovery: A Rollback feature allows administrators to return volumes to an earlier point-in-time in the case of data corruption or a software virus. Data Migration: Snapshots are ideal for making full copies of a volume for data migration, often in conjunction with corporate moves, system upgrades, or to meet business continuity objectives. Content Distribution: A Snapshot can be used for copying the contents of a volume that can be modified without changing the contents of the original Live Volume. Copy-On-First-Write (COFW) that only copies data blocks if and when an application changes them. The StoneFly SAN Command Line Interface (SFSANCLI.exe) utility provides a way to use a command line to create and delete Snapshots. It is designed for use in creating automated scripts or batch files that can be used to make backup copies of Snapshots.